Husband has often talked about a cake his mom used to make called Boiled Raisin Cake. I asked her about it once while we were up for a visit and she told me it was a bit of this and a pinch of that and you cook it till it looks just so. And since I was in another country, had half a bottle of wine in me and was on vacation mode, I didn't retain much of the conversation. So I decided to look through a bunch of my old cookbooks to see what I could find. I love any excuse to pull out my collection. I have a box of old community and church cookbooks from all over with yellowed pages and missing covers. I love looking at recipes with ingredients like oleo and sweet milk. You can’t find that kind of nostalgia on the internet. I didn't find what I was looking for but I did find something called a Sour Cream Raisin Pie. I kept trying to ignore the pie because I was after a cake but I couldn't get it out of my mind. The sour cream cooks up almost like a caramel and the raisins plump up and get all lovely and the whole thing is wrapped in a warm blanket of cinnamon and nutmeg. I found several recipes and while they all had the same basic ingredients, the amounts varied greatly. And so did the cooking method. Some cooked on the stove and some baked in the oven. I hashed out the one below and went for it. And I’m so glad I did because this pie is amazing! And I love what happens to the sour cream when you cook it with sugar on the stove. I see more of that combo in my future fo sho! 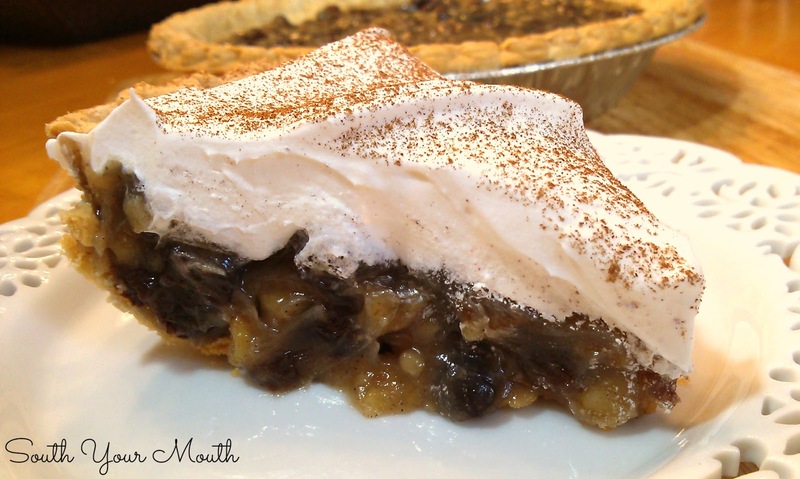 If you want to make something different for Thanksgiving or Christmas, definitely give this vintage pie a try. It has all the warm notes of a pumpkin or apple pie so it’ll feel like the holidays but it won’t be the same-ol’, same-ol’! I saw recipes with meringue and without and decided to just top mine with cool whip. And before you get all preachy at me about cool whip, here’s my 2-cents on the topic… real whipped cream doesn't stay whipped forever so if I know something I’m making is going to spend a few days in the fridge before we’ll eat it all, I use cool whip. If I’m serving guests, I’ll usually use real whipped cream since it will all be eaten immediately. Combine sugar, sour cream, eggs, flour, vanilla, salt, cinnamon and nutmeg in a large saucepan and stir well until combined and smooth. Add raisins and stir until combined. Heat and stir over medium heat until slightly boiling. Once slightly boiling, reduce heat to medium-low and simmer, stirring occasionally, for 5 minutes or until mixture has thickened. Stir in nuts then divide filling evenly into pie shells. Cool for 10 minutes then refrigerate, uncovered, until cold. Once cold, top each pie evenly with cool whip then dust with cinnamon. I usually do this with a small mesh strainer for a more even and delicate dusting. Cover and refrigerate to store. This looks really good, thanks for sharing. BTW.... I googled Boiled Raisin cake and found several recipes for it. One from allrecipes.com looked easy and tasty, so I think I'll give it a try. I love this Mandy! This is an old southern pie my grandmother used to make! Thank you for reminding us! I am going to make your version this weekend! Love your recipes!!! No, this isn't the same as a Mincemeat pie. I am so happy to have this ! A lovely lady whom I still love very much used to make these and I love them. Thank you Mandy ! I am such a fan ! This recipe is absolutely yummy! Great for breakfast with a cup of good coffee. My husband liked it better than pecan pie! Just thought I would share a TIP I learned about stabilizing whipped cream. Whip the cream to soft peak stage, then add in 1 tab of superfine sugar, mixed with 1/2 teaspoon of instant clear gel. Then beat the cream till stiff (the instant clear gel works almost immediately). You will never go back to cool whip again. 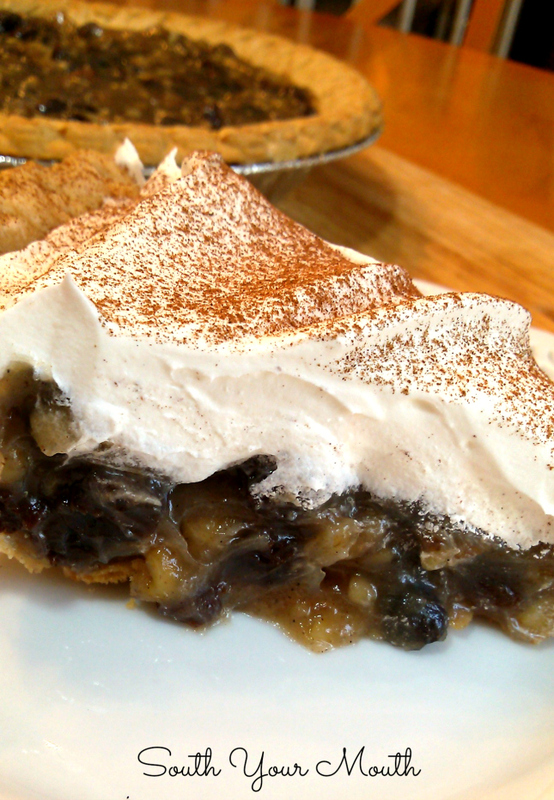 I also added a tablespoon of dark rum into the cream (rum raisin pie ?). I love your site and your book. Thanks. I always thought raisin pie went into a raw shell and baked??? NO? Looks great! Could you possibly substitute DATES for the raisins??Thanks! Donna, I just saw this, and would love to get your grandmother's recipe for War Cake, if you are still offering. My email is saileach1@gmail.com and my name is Nancy. Thank you! Donna.....I would also love the "War Cake" recipe. Thank you so much! Google War Cake Recipe. Alot there!